Home Compare products Myposeo Pro Features SEO Rank Tracking Migration or redesign a website, why use an SEO rank tracking tool? When you redesign your website or your e-commerce, you need to pay particular attention to your site’s SEO. Although it is easier to keep the traffic generated by other sources (AdWords, display, social network, emailing), migration or redesign mean it is not always easy to maintain its position in search engines. In a migration of your website to an other server, there is usually only a small risk of a significant fall in SEO ranking. Potentially, the effect is the opposite because this manoeuvring is often done to improve load times or server availability. Nevertheless, it is interesting to monitor its SEO to see the potential gain from migration. For site redesigns and changes of domain name (NDD), the risk of a loss of ranking is greater, due to the fact that Google will have to re-index all your site, even if you create your references carefully. Losses in terms of traffic and therefore in terms of business (turnover) can be significant where redesign is concern, so it is essential to monitor your SEO. Analysis carried out also of the SEM analysis tool of myposeo. 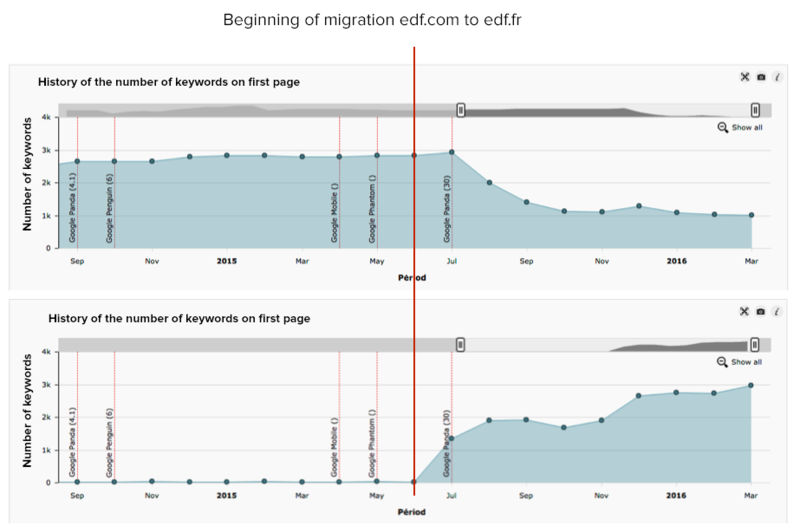 The migration of edf.com to edf.fr is apparently progressive because not all the URLs appear to have changed. 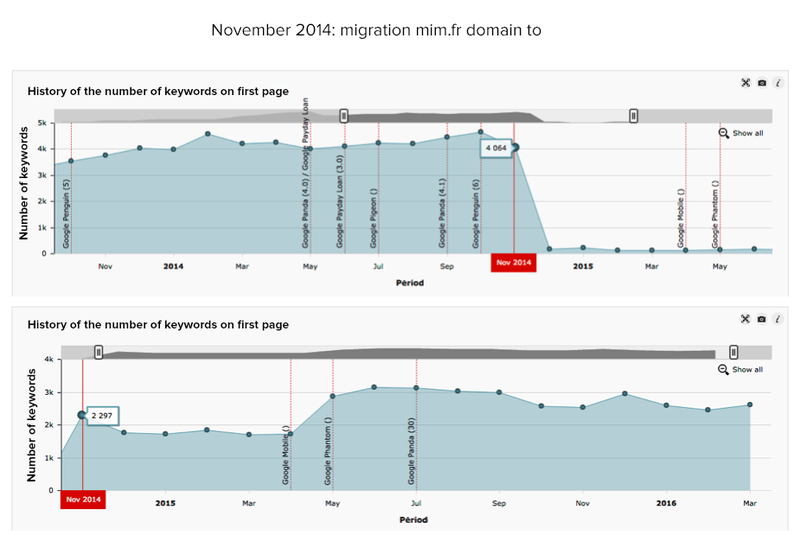 For the mim.fr domain that wanted to migrate to mim.com, there was apparently a major difference between the number of keywords positioned before and after the migration. This certainly had an impact on SEO, and it seems that the site took some time to return to a number of similar keywords on the first page of Google. In both cases mentioned above, we can see an overall decline in positioned keywords that allows understanding of the potential variation in traffic. To analyse the importance of SEO for your audience, it is essential to know the part that SEO represents with regard to your other levers. Thus, you find today in Google Analytics (“Acquisition” section) for example, the share of traffic represented by the Organic Search (SEO). In the example above (taken on an e-commerce site), we notice that this one is about 50%, so it is crucial to monitor the asset in terms of positioning to avoid losing the valuable work done throughout the life of the site. Tracking positions: what volume to monitor? This depends on your website’ current SEO and the volume of keywords on which you already have very good ranking. To check this, you can start by using a market analysis tool. 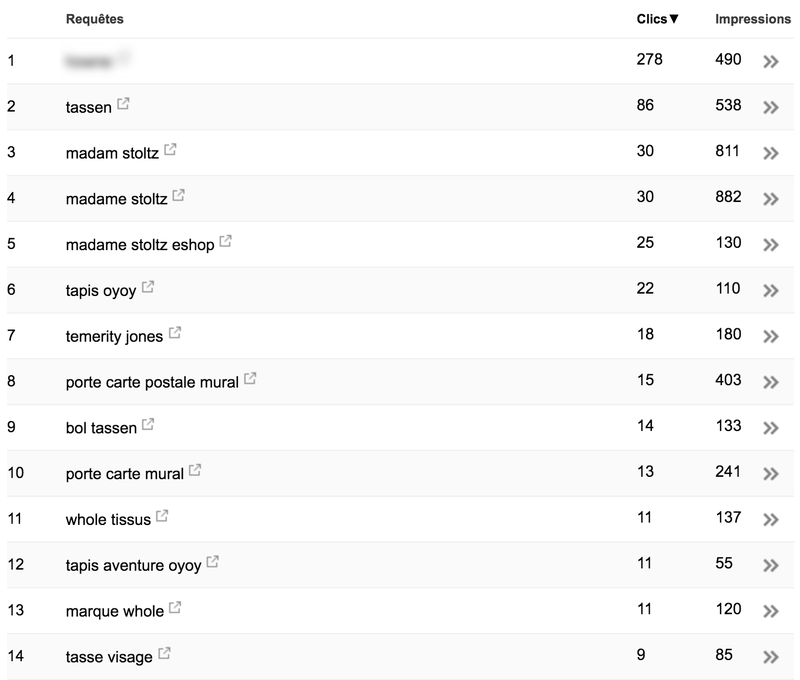 For animaute.fr site (screenshot above) we notice that the current number of keywords on the first page of Google is 609 (on a base of 15 million in the myposeo tool). Monitoring the trend helps to know how SEO evolves and the number of keywords already ranked is a good indicator of volume to follow. If you have a large number keywords already well ranked, it is important to focus on the essential keywords of your business and generic keywords, without forgetting the traffic generator of keywords. The recovery of these keywords will allow to make a rank tracking to assure you that you preserve well your SEO before and after the redesign or migration of your website, on a representative volume of your current traffic. We are often asked about the best time to put in place SEO rank tracking and ranking, during redesign or migration. The answer is usually now! If you already know the dates of migration, you should, ideally, set up tracking 1 or 2 MONTHS before, to observe the ranking’s evolution over time, as shown in the example below. Following a migration, the site ranking may fall for an indefinite period before returning to normal (or even grow). That’s why the sooner is better! What indicators should we be watching? These two indicators are interesting because a drop in ranking does not always causes a decline in traffic, as shown in the example below. The average position of the keywords monitored for the site fell in November 2015 but after this date the traffic gradually began to increase, reaching a level 4 to 5 times higher that before! 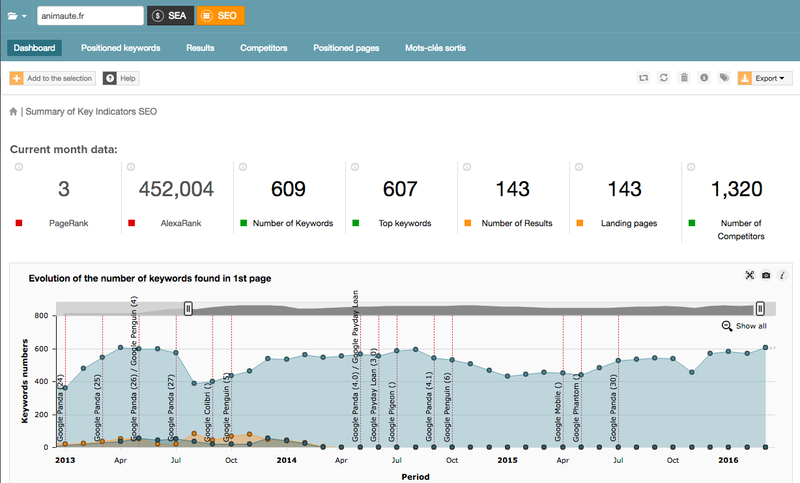 This example proves that the site redesign was a good thing and that monitored well, this one allows finding the average position on keywords while displaying a rapid multiplication of traffic! Using a rank tracking tool allows monitoring of the visibility of your site and track SEO performances over time. This is especially indicated during a redesign or migration and allows measurement of the positive or negative impact of the exercise. The data market must be addressed and equipped as soon as possible to progress, or fail.